Prairie manufacturers are on a tear. Export sales into a robust U.S. economy and to markets in Asia and Latin America are booming. And, it looks like there is still plenty of momentum in those markets to sustain sales growth over the year ahead. Yet, despite an optimistic outlook for revenue growth, 2019 will prove to be a year of heightened uncertainty and rising cost pressures for manufacturers across Canada. Bottom-line performance will not be as strong as top-line expectations. Good news first: Since the end of 2016, Prairie manufacturers have enjoyed a period of exceptionally strong revenue growth. The total value of goods produced and shipped by manufacturers across the three Prairies provinces jumped by 18 per cent between December 2016 and August 2018, when overall monthly sales stood at a record $9.8 billion. For the past year-and-a-half, sales growth for Prairie manufacturers has been running at almost double the 9.5 per cent national average. Manufacturing sales are up by 16 per cent in Manitoba, 15 per cent in Saskatchewan, and 19 per cent in Alberta. That’s just as strong a performance as the boom that took place in western manufacturing between 2010 and 2012. And, it is happening in many of the same sectors of manufacturing — petroleum and chemical products, wood products, fabricated metal products, machinery, and equipment. Sales growth can be expected to remain strong throughout the remainder of 2018 and into next year, although growth rates are likely to slow. New orders and order backlogs are both running at record highs — the former at roughly the same level as monthly sales, the latter about 50 per cent higher. Sales and orders are growing because customer demand is increasing, leading to higher levels of output. Still, about 40 per cent of the sales growth we’ve seen over the past year-and-a-half can be attributed to price increases. Prairie manufacturers have been able to take advantage of renewed pricing leverage in North American and global markets. Their prices have risen more rapidly than their input costs. But, now, operating costs are also on the rise and will remain a concern throughout the year ahead. The full impact of U.S. tariffs on aluminum, steel, and Chinese imports has yet to make its way through North American supply chains. The hit from retaliatory tariffs imposed by Canada and Mexico on imports from the U.S. is already being felt. Tight job markets and new regulations are pushing up labour costs. Plus, central banks in Canada, the U.S., and other major economies are increasing interest rates in response to stronger economic growth and rising price levels. Higher interest rates will increase borrowing costs for manufacturers. They will also very likely spur demand for higher wages. Unfortunately, the very same forces that are pushing up costs are also beginning to slow growth in customer demand. Lower interest rates in the aftermath of the Great Recession have done their job to reflate the global economy, but a return to more normal levels won’t be easy. Consumers, households, businesses, and governments have been on a borrowing spree around the world. Household and consumer debt now account for record levels of after-tax personal income in Canada. Government debt has never been higher in the United States and Europe. And, soaring levels of business and government debt make emerging markets highly vulnerable to any significant increase in borrowing costs or downturn in asset markets. Even China is not immune. Growth in the world’s second-largest economy is slowing down — albeit to a still torrid pace of 6.5 per cent. Higher interest rates are bad news for manufacturers everywhere. So, too, is the political uncertainty that surrounds American trade policy, Brexit negotiations, and the future of the European Union and the other international institutions that underpin trade and market stability in the global economy. The conclusion of ‘NAFTA 2.0’ negotiations has calmed business concerns here in Canada to some degree. But, neither U.S. nor Mexican ratification of the USMCA can be taken for granted. The Trump administration has shown that it can be highly capricious when it comes to slapping tariffs on imports. Protectionist pressures are also mounting in Europe. Meanwhile, the stand-off in trade relations between the United States and China is unlikely to be resolved anytime soon. Geopolitics may be in a mess, which means manufacturers should be cautious. There are also, however, many reasons for optimism in the year ahead. The U.S. economy is humming and capacity constraints south of the border will generate further demand for imports from Canada. Canada’s Comprehensive Economic and Trade Agreement with Europe and our newly ratified trans-pacific agreement will open new markets in Asia-Pacific — most notably in Japan — for commodities and processed goods from the Prairies. Canadian exporters should benefit from the displacement of U.S. goods in Chinese markets as well. Is it time for a strategic rethink? Absolutely. 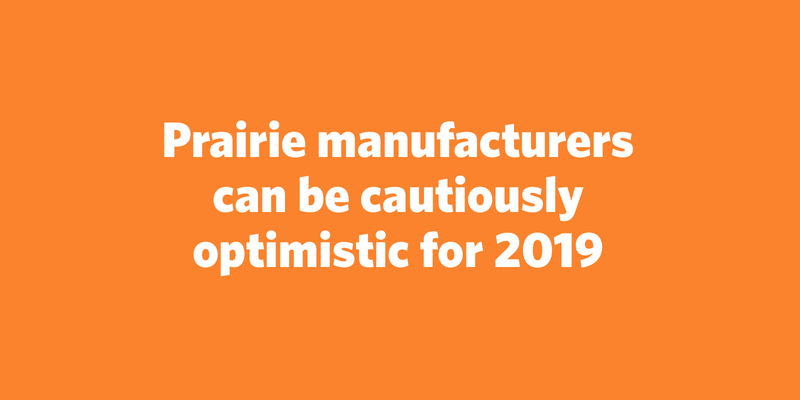 Prairie manufacturers need to prepare for new growth opportunities and for elevated levels of political and market risk. Manufacturers also need to double-down on their efforts to innovate and improve productivity, because out of all the economic and political factors that will shape market prospects in 2019, none will be more telling than the ability of manufacturers to keep pace with changing technologies and customer expectations. Jayson Myers is the CEO of Next Generation Manufacturing Canada — the country’s advanced manufacturing supercluster. An award-winning business economist and leading authority on technological change, Myers has counselled Canadian prime ministers and premiers, as well as senior corporate executives and policymakers around the world.